Traditional neighborhood design (TND) (also called new urbanism or neotraditional design) is a town planning principle that is gaining acceptance in recent years as part of the solution to a variety of problems in suburban communities throughout the country. Traditional neighborhoods are more compact communities designed to encourage bicycling and walking for short trips by providing destinations close to home and work, and by providing sidewalks and a pleasant environment for walking and biking. These neighborhoods are reminiscent of 18th and 19th century American and European towns, along with modern considerations for the automobile. 6.3 "Putting the Brakes on Suburban Sprawl"
This lesson has been primarily derived from two sources: a 1994 article in Engineering News–Record on traditional neighborhood design, and the Neo–Traditional Street Design Handbook from ITE. Additional sources of information are listed at the end of the lesson. While new urbanism has been a positive influence on the field of planning and engineering, it has also been a source of considerable debate. Hundreds of new urbanist developments have been built throughout the country. Yet many have not achieved some of the more lofty goals of their founders, who hoped that families living in new urbanist communities would own fewer cars and make most of their daily trips on foot. New urbanist neighborhoods are often built as an alternative to the sprawling style of suburban development. While traditional neighborhoods offer a better alternative to the single use, monocultural suburban neighborhood that was ubiquitous in the past, they are sometimes built on open land on the urban fringes many miles from the urban center and surrounded by high–volume arterial roadways. Another criticism has been that housing in these new traditional neighborhoods is often beyond the price range of lower– to middle–income families. These neighborhoods become enclaves of good design; however, they do not solve transportation problems because their residents still drive to most destinations. New urbanism has been one of the hottest new planning theories among the modern generation of planners. It is appealing to start with a clean slate in a new development and build well the first time. However, a great deal of work lies ahead to redesign standard suburban standard suburban neighborhoods and streets in the United States to be more conducive for nonmotorized use. The task of retrofitting existing suburban and urban communities to accommodate and encourage walking and bicycling is a daunting challenge. For other perspectives in the debate on new urbanist design principles and goals, see the references at the end of this lesson. The planning profession continues to strive towards development principles that result in fewer automobile trips and more walking trips, and the failures of the new urbanist movement are as instructive as the successes. This lesson strives to address both topics, and begins with a article that appeared in the May 1994 edition of Engineering News–Record. (1) It is written from an engineering perspective, and provides a historical backdrop of the issues that were debated during the mid 1990s, at the initial outset of a movement that has now reached nearly every corner of the U.S. The following article, "Putting Brakes on Suburban Sprawl," is reprinted with permission from Engineering News Record (ENR), May 1994. Readers should note that the terms used in this article—new urbanism, neotraditional design, traditional neighborhood design—are considered interchangeable, as they are in the rest of this lesson and this entire course. New urbanists are zealots. They proselytize their antidote to alienation—new old–style towns—with a missionary’s fervor. And after a frustrating first decade bucking an automobile–driven society unfriendly to their peripatetic ways, they are beginning to make great strides. With several neotraditional neighborhoods built, public planners are taking notice. Some are even adjusting general plans and zoning for compact walkable mixed–use towns. Suburban traffic engineers and public works officials are no longer simply recoiling at the prospect of pedestrian–friendly street patterns with narrower, gridded, and tree–lined streets. And market surveys are convincing skeptics that suburban residents are content living in a town that by design nurtures both community consciousness and the individual spirit. "Contemporary suburbanism isolates and separates [see figure 6–1]," says Paul Murrain, an urban planner based in Oxford, U.K. Consumers are recognizing "in their hearts" the better quality of life offered by new urbanism, he adds. Though new urbanism is also intended for cities cut to pieces by highways, it is more the planner’s answer to suburban sprawl and the breakdown of community caused by a post–World War II obsession with the automobile. Apart from nearly total dependence on the car, the typical suburb, with its looping or dendritic street pattern and dead–end cul–de–sacs, "is laid out so that it can’t grow," says Andres Duany, partner in Andres Duany & Elizabeth Plater–Zyberk Architects and Planners (DPZ), Miami. "It chokes on itself in very short order." "Suburban sprawl is riddled with flaws," Duany continues. Unfortunately, "all of the professions [involved in development] have sprawl as their model." Figure 6–1. Illustration. New urbanism allows travel from one destination to another without using collector roads. Even those who do not subscribe to new urbanism see a need for change. "We are finally recognizing we should plan communities, not structures, " says Carolyn Dekle, executive director of the South Florida Regional Planning Council, Hollywood. New urbanism is a return to romantic ideas of the past and does not respond to current lifestyles," says Barry Berkus, principal of two California firms, B3 Architects, Santa Barbara, and EBG Architects, Irvine. "But it is part of a knee–jerk, but needed, reaction to irresponsible planning that produced monolithic neighborhoods without character." Duany, both charismatic and outspoken, and his cerebral wife Plater–Zyberk are in new urbanism’s high priesthood. To focus attention on their goals, DPZ and several others created the Congress for the New Urbanism last year. The second meeting is set for May 20 to 23 in Los Angeles. "We need all the converts we can get," says Duany, because, "inadvertently, one thing after another prevents it." Among these are fear of change and criticism that the new urbanism model is too rigid—robbing the individual residents of choice. Regardless of criticism, converts are beginning to spill out of the woodwork. "Before my conversion, I was a schlock developer," confesses John A. Clark, of the Washington, DC, company that bears his name. "Most of my stuff was so bad it makes your teeth ache." Then in 1988, after reading about neotraditional development, the movement’s original name, "the light bulb went off," says Clark. He called Duany and soon enlisted DPZ in the campaign for Virginia’s Haymount. There are other tales of conversion. "We were Duanied," says Karen Gavrilovic, principal planner in the Loudoun County Planning Dept., Leesburg, VA. Last year, the county adopted a comprehensive general plan based on new urbanism, which just won an American Planning Association award. Until new urbanism becomes mainstream, the approvals process for each community tends to be tortuous and therefore expensive. "The thing that must change is the cost of establishing new communities," says Daniel L. Slone, a lawyer with Haymount’s counsel, McGuire Woods Battle & Boothe, Richmond. "It will take the cooperation and leadership of planners, politicians, and environmental and social activists." Approvals are complicated. The approach "raises hundreds of land–use questions" that must be answered, says Michael A. Finchum, who as Caroline County’s director of planning and community development, Bowling Green, VA, is involved with Haymount. "Anything new is of concern," especially to lenders and marketers, agrees Douglas J. Gardner, project manager for developer McGuire Thomas Partners’ Playa Vista, a new urbanism infill plan sited at an old airstrip in Los Angeles (ENR, 10/04/93, p. 21). But Gardner sees planning obstacles as surmountable and blames Playa Vista’s 5–year approval time on a trend toward a "more rigorous regulatory framework" for all types of developments. New urbanism combines aspects of 18th and 19th century American and European towns with modern considerations, including the car. As in Loudoun County, the model can be applied on any scale—to a city, a village, or even a hamlet. In West Palm Beach, FL, which is drafting a new urbanist downtown plan, it is superimposed on an existing urban fabric. Though most of the architecture so far has been traditional, any vernacular is possible. Like a bubble diagram, neighborhoods should overlap at their edges to form larger developed areas, interconnected by streets, public transit, and bicycle and footpaths. Regional mass transit and superhighways enable workers to commute to remote job centers. To make new urbanism work on a wider scale, San Francisco–based Calthorpe Associates promotes urban growth boundaries and future development around regional transit. But localities are afraid they will lose control, so most States have not authorized regional governance, says Peter A. Calthorpe. The result is "fractured development, no regional transit, and no attention to broader environmental and economic issues," he says. There are many proposed new urbanism projects, but less than a dozen are built. Most, not yet 5 years old, have yet to reach build–out. The more well known are DPZ’s Kentlands in Gaithersburg, MD; architect–planner Calthorpe’s Laguna West in Sacramento; architect Looney [R]icks Kiss’ Harbor Town in Memphis; and DPZ’s Seaside, a northern Florida vacation–home town. Retrofits are possible, but more difficult [see figure 6–2]. Subdivisions, with multiple landowners and streets that are nearly impossible to link, are the most troublesome. Office park and shopping center makeovers, such as Mashpee Commons on Cape Cod, are easier because the cost of a parking garage to free up surface lot space for development can often be financially justified, says Duany. Figure 6–2. Photos. 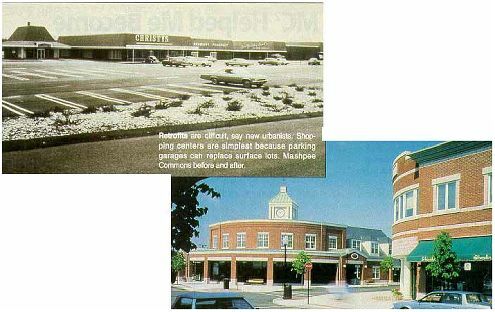 Mashpee Commons before and after retrofitting. The optimal new urbanism unit is 160 acres. Typically, the developer provides the infrastructure. The town architect establishes and oversees the plan and designs some structures. But other architects are also involved. Public buildings and space, including a community green, are located near the center, as are many commercial buildings. Under new urbanism, there is often no minimum building setback. Lot widths are typically multiples of 4.9 m (16 ft), and are 30.5 m (100 ft) deep. There are a variety of residential buildings—apartment buildings, row houses, and detached houses—usually mixed with businesses. Finally, there are alleys lined by garages and secondary buildings, such as carriage houses and studios. All elements are planned around "the distance the average person will walk before thinking about getting in the car," says Michael D. Watkins, Kentlands’ town architect in DPZ’s Gaithersburg [MD] office. That is a maximum 5–minute walk—a quarter mile or 1,350 ft [0.4 km or 411 m] —from a town center to its edges. New urbanists maintain that a family will need fewer cars. Duany likes to point out that it costs an average of $5,500 per year to support each car, the equivalent of the annual payment on a $55,000 mortgage. Sidewalks are usually 1.5 m (5 ft) wide instead of 1.2 m (4 ft). Streets, designed to entice, not intimidate, walkers, are typically laid out in a hierarchical, modified grid pattern. The broadest are 11.0 m (36 ft) wide; the narrowest, 6.1 m (20 ft). On–street parking is encouraged and counted toward minimum requirements [see table 6–1]. Vehicle speed is 24.1 to 32.2 kilometers per hour (km/h) [15 to 20 miles per hour (mi/h)], not 40.2 to 48.3 km/h (25 to 30 mi/h). Curb return radii are minimized so that a pedestrian crossing is not daunting. Superhighways are relegated to the far outskirts of town. In a grid, traffic is designed to move more slowly, but it is also more evenly distributed so there are fewer and shorter duration jams, says Duany. In the typical suburb, broad commercial streets, called collectors, have become wall–to–wall traffic, while loop and cul–de–sac asphalt typically remains underused. Table 6–1. Comparison of new urbanism versus standard street design practices. Berkus objects to the grid, except to organize the town center. The "edges should be organic" for those who perceive "enclaves" as safer and more secure places to live, he says. Bernardo Fort–Brescia, principal of the Miami–based Arquitectonica, also thinks the undulating street and cul–de–sac should be offered. "There are no absolutes," he says. The firm’s plan for Meerhoven, a new town proposed for Holland, reflects many new urbanist concepts in a modern vernacular. "Nothing is faked to appear old," says Fort–Brescia. Every element has a function based on modern lifestyles. For example, the town lake is sized for triathlon swimming and perimeter marathon runs. But pedestrians and bikers are encouraged. And mass transit will whisk commuters to jobs elsewhere. Arquitectonica is fortunate—there are no intractable standards in the way of its plan. But in the United States, new urbanists say their biggest roadblocks are existing street design standards geared to traffic volume and efficient movement, and zoning that prohibits small lots and mixing building types. For example, firefighters and sanitation officials want to have a street wide enough for trucks to turn corners without crossing the centerline. "Public works will view your proposal with suspicion" because in new urbanism, traffic is no longer the driving force behind street design, says Frank Spielberg, president of traffic engineer SG Associates Inc., Annandale, VA.
Spielberg, sympathetic to new urbanism, but cautious about traffic issues, says there are still questions: Lower expected traffic volume justifies narrow streets, but is actual traffic volume lower? How long would it take to convince residents they need fewer cars? Will traffic be retained within the project, which would relieve the developer of adjacent road upgrades? Traffic engineers have been working for 40 years to accommodate the proposals of architects and planners, maintains Spielberg, chairman of the Washington–based ITE’s 5–year–old committee on traffic engineering for neotraditional development. Now that the approach is changing, "traffic engineers will respond," he says. "Surprisingly, traffic engineers, the most recalcitrant of all, are the first to reform," agrees Duany. ITE plans to publish neotraditional street design guidelines late this year or early in 1995. In addition to ITE’s manual, which already contains residential street guidelines, there are AASHTO standards. They support compact projects, "but only if you already know where to look," says C.E. Chellman, CEO of White Mountain Survey Co., a land surveyor–engineer in Ossippe, NH, and editor of ITE’s draft guidelines. Chellman says transportation officials often forget that ITE and AASHTO standards are not binding codes. Officials are reluctant to use judgment, he says. Some engineers simply take issue with the specifics driving new urbanism. Skokie, IL–based traffic engineer Paul C. Box, who wrote the existing ITE residential street guidelines, claims lowering the speed limit is against human nature. He says on–street parking is dangerous because children get hit running out between parked cars. He is against narrower through streets and the bicycle as transportation unless separate bike paths or lanes are constructed, which he says is too costly. He also thinks undulating sidewalks are safer than those along the street. Until there is a body of research to support it, mainstream lenders and commercial interests will continue to shy away from new urbanism, says James Constantine, principal of Community Planning Research Inc., Princeton, NJ. In February, Constantine released data from a survey of "active" home–buyers [sic] attending the Home Builders Association of Memphis show at Harbor Town last September. Of 123, "a whopping two–thirds" said they ’d "like" to live in a neotraditional neighborhood, he says. The only market resistance was to small lots and minimal setbacks, he adds. John H. Schleimer, president of Market Perspectives, [Roseville], CA, says even home buyers surveyed recently who bought elsewhere "like" the idea of community and the option of walking places. But many said they paid the same price for bigger homes on larger lots. Haymount’s Clark isn’t rattled: "Someone who wants to live on a mansion–size lot and ’commit cul–de–side’ has to go elsewhere. That’s why there is vanilla and chocolate." Traditional neighborhoods have begun to appeal to both community designers and home buyers alike. It is important, however, to consider that traditional street design fundamentally differs from standard suburban street design. In recent years, many developers have claimed that their projects are new urbanist, but are in fact missing critical features. This section provides more specific details on traditional street design, and explains how it is different from standard suburban street design. Standard suburban street design is characterized by a hierarchical, tree–like pattern that proceeds from cul–de–sacs and local streets to collectors to wide arterials. The organization of the network collects and channels trips to higher capacity facilities. The use of streets in residential areas for intercommunity and through traffic is minimized by limiting access by constructing few perimeter intersections, reducing interconnections between streets, and by using curving streets and cul–de–sacs in the development. Where this layout is successfully designed and constructed, automobiles are the most convenient choice for short, as well as long, trips. The street layout forces longer, less direct auto travel when street connections are missing. The hierarchical street layout reflects the guiding principle that streets on which residences front should serve the least traffic possible. At best, only vehicles traveling to or from the homes on a given street would ever appear on that street. There would be little or no through traffic, hence the prevalence of cul–de–sacs (see figure 6–3). Traffic from residential streets is quickly channeled through the street hierarchy to collectors and then to arterials. Only arterials, fronted primarily by stores, offices, or apartments, provide direct connectivity between land uses and other neighborhoods. By contrast, TND calls for an interconnected network of streets and sidewalks to disperse vehicular trips and to make human–powered modes of travel (such as walking and biking) practical, safe, and attractive for short trips. Motorists, pedestrians, and public officials will find the regular pattern more understandable. A TND street pattern can also have a hierarchy, with some roadways designed to carry greater traffic volumes. A basic assumption of new urbanist planning, however, is that neighborhood streets that serve local residential trips can also safely serve other neighborhood trips and some through traffic. For example, a street with 40 homes would need to carry about 20 vehicle trips during the peak hour. The effective capacity of this street could easily be 200 vehicles per hour without a significant effect on safety or environmental quality. By limiting the access to the street as in standard suburban design, 90 percent of its effective capacity is wasted. Nearby arterials must make up the difference. Figure 6–3. Photo. Typical suburban neighborhoods offer few route choices for trips. By eliminating dead ends and designing all streets to be interconnected, neotraditional neighborhoods provide multiple route choices for trips. By using narrow streets and by constructing more of them, more, yet smaller, intersections are created. In concept, therefore, overall network capacity is increased, traffic is dispersed, and congestion is reduced in neotraditional communities. While this rationale seems intuitively correct, it must be carefully applied. Land use and density are not constant across a neotraditional community. Larger traffic generators will attract larger numbers of vehicles that may require multilane streets and intersections. Planners discourage alleys in standard suburban residential areas. In a typical suburban development, an alley behind homes serves no function because garages and their driveways are accessed from the street. However, in TND, alleys give neighborhood planners design flexibility by permitting narrow lots with fewer driveways on local streets. Fewer driveways also mean more affordable, smaller home sites and more space for on–street parking, especially if the home–owners use the alleys for their own vehicular access, parking, and utilitarian activities. Alleys provide space for underground or unattractive overhead utilities while freeing streets for trees and other plantings. Alleys also can be used for trash storage and collection and emergency vehicle access. TND projects do not have alleys everywhere, but where they do, traffic safety may improve. Alleys eliminate residential driveways and the need for backing up onto the street, which would otherwise occur and is inherently unsafe. Design speeds for standard suburban neighborhood streets range from a minimum of 40.2 or 48.3 km/h (25 or 30 mi/h) to 72.4 km/h (45 mi/h). The design speed recognizes the type of facility (local, collector, or arterial), and it allows for a standard 8.0 or 16.1 km/h (5 or 10 mi/h) margin of safety above the 85th percentile speed, which is usually the posted speed. Often, the signing of wide streets for 40.2 to 56.3 km/h (25 to 35 mi/h) simply results in more speed violations. It is not unusual for neighbors to complain of speeding traffic on neighborhood streets and to request actions to slow the traffic. Stop signs, speed bumps, "Children at Play" signs, and the like might have to be used to slow vehicles from the original design speed of the street. New urbanism projects attempt to control vehicle speeds through careful design of streets and the streetscape. Minimum TND street design speeds are 24.1 to 32.2 km/h (15 to 20 mi/h). On–street parking, narrow street widths, and special design treatments help induce drivers to stay within the speed limits. T–intersections, interesting routes with lots of pedestrian activity, variable cross section designs, rotaries, landscaped medians, curb extensions, and other treatments may be used. At slower speeds, the frequency of vehicular crashes may decline, and those that do occur may be less severe. What is not clear is whether or not the frequency of pedestrian–vehicle crashes also decreases with speed. Pedestrian crash types are often associated with darting out from between parked cars, walking along roadways, crossing multilane intersections, crossing turn lanes, dashing across intersections, backing vehicles, ice cream vending trucks, and bus stops. For new urbanism projects, the goal is to create more active streetscapes involving more of the factors that slow drivers. These include parked cars; narrow street width; and eye contact between pedestrians, bicyclists, and drivers. The overall impact of these elements of design is enhancement of the mutual awareness of drivers and pedestrians. Thus, many professionals believe that in a traditional neighborhood, drivers are more likely to expect pedestrians and avoid them in emergency situations. In standard suburban neighborhoods, street type, width, and design speed are based on projected vehicle volumes and types. The larger the vehicle permitted on the street according to local regulations, the wider the street. The focus is on motorized vehicles, often to the exclusion of pedestrians, other transportation modes such as bicycles, and other considerations of the community environment. Ideal suburban lane widths per direction are 3.7 m (12 ft), while exclusive turn lanes may be 3.0 m (10 ft) or less. Depending on whether or not parking is permitted, two–lane local street widths vary from 6.7 to 11.0 m (22 to 36 ft), while two–lane collector streets vary from 11.0 to 12.2 m (36 to 40 ft). In many suburban jurisdictions, the minimum street width must accommodate cars parked on both sides, an emergency vehicle with its outriggers, and one open travel lane. These possible uses instead of reasonably expected uses lead to a worst–case design scenario, an excessively wide street, and probable higher travel speeds. In contrast to standard street design, the width of TND streets is determined by the projected volumes and types of all the users of the street, including pedestrians. The actual users of the street and their frequency of use help determine street width. In addition, TND–type standards come into play. The basic residential TND street has two lanes, one for each direction, and space for parking on at least one side. The resulting minimum width may be as narrow as 8.5 to 9.1 m (28 to 30 ft). Design considerations, however, may preclude parking in some areas, perhaps to provide space for bicyclists. If traditional communities encourage narrower streets with parking, then vehicles will naturally slow and stop for parking maneuvers and for larger approaching or turning vehicles that may encroach on the other lane. The TND concept is that drivers must be more watchful (as they usually are in central business districts) and, once more watchful, drivers expect to and do stop more frequently. To alert drivers to the relative change in importance between vehicles and pedestrians, they must be warned at entrances to the TND street pattern. This warning must be more than signs. Narrower streets, buildings closer to the street, parked cars, smaller signs, and the generally smaller, much greater visual detail of a pedestrian–scale streetscape all serve as good notice to the visitor. Curb radii in suburban neighborhoods match expected vehicle type, turning radius, and speed to help ensure in–lane turning movements if possible. In order to accommodate the right–hand turning movements of a tractor trailer and larger vehicles, no matter what their frequency of street use, suburban streets typically have minimum intersection curb radii of 7.6 to 10.7 m (25 to 35 ft). Some jurisdictions require 15.2 m (50 ft) or more. What such large curb radii do for smaller, more predominant vehicles is to encourage rolling stops and higher turning speeds. These conditions increase the hazards for crossing pedestrians. The large curb radii effectively increase the width of the street, the pedestrian crossing time, and the exposure of pedestrians to vehicles. TND curb radii are usually in the range of 3.0 to 4.9 m (10 to 15 ft). They depend on the types of vehicles that most often use the street, not the largest expected vehicle. The impacts on pedestrians, parking spaces, and turning space for larger vehicles are also considered. The smaller the curb radii, the less exposure a crossing pedestrian has. Furthermore, an additional parking space or two may extend toward the intersection with small curb radii, or if parking is prohibited, additional room for turning vehicles is created. Many manuals detail standard intersection design and analysis for suburban developments. (2) Such intersections are designed for an environment in which the automobile is dominant. Hence, traffic engineers attempt to maximize intersection capacity, vehicle speed, and safety. They also aim to minimize vehicle delay and construction cost. As a result of the hierarchical approach to street system design, which carries traffic from narrow local streets to larger collectors and arterials, intersection size and complexity grow with the streets they serve. Drivers of these streets expect an ordered structure ,and any anomalous designs present safety problems. In TND, the concept of connected patterns of narrow, well–designed streets is intended to improve community access in spite of low design speeds. The numerous streets provide more route choices to destinations and tend to disperse traffic. In concept, the more numerous, smaller streets also mean smaller, more numerous, less congested intersections. Again, due to slower vehicular speeds, greater driver awareness, and the desire for vista terminations, some TND intersection designs are typically different from standard suburban designs. 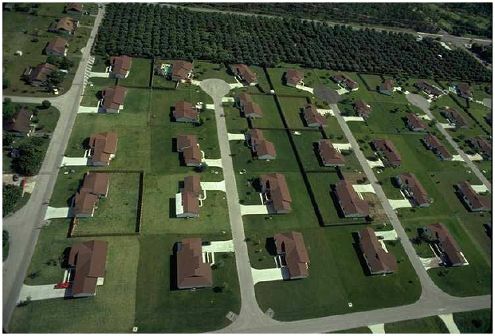 Subdivision standards and roadway design practice strictly control the size and location of street trees and other plantings. Some local regulations may even prohibit trees and other plantings near the street. These guidelines originated with the precedent of the forgiving roadway that arose through tort actions. They generally place trees far from the edge of high–speed roads to reduce the chance of serious crashes if vehicles swerve off the road. For suburban streets with lower design speeds and space for parked cars, trees can be closer to the street. 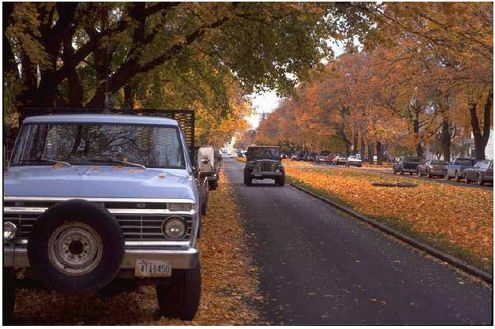 Trees and landscaping form an essential element of the streetscape in TND projects (see figure 6–4). The relationship of vertical height to horizontal width of the street is an important part of creating a properly configured space or outdoor room. On some streets that feature single family housing, the design may call for setting the houses back somewhat from the street. In neighborhoods and along streets such as this, the trees form an important part of that street. While providing shade and lowering street and sidewalk temperatures, they create a sense of closure in a vertical plane. Along streets that contain townhouses and stores with apartments above them, actual full–sized trees become less important, while smaller trees and landscaping remain essential elements. Figure 6–4. Photo. Neotraditional neighborhoods have narrower, tree–lined streets. Typical suburban neighborhood design calls for large, efficient luminaires on high poles spaced at relatively large distances. Their purpose is not only to illuminate the nighttime street for safer vehicle operation, but also to improve pedestrian and neighborhood security. Street lighting in traditional neighborhoods serves the same purposes as that in standard suburban neighborhoods. However, the intensity and location of the lights are on a more pedestrian scale. Smaller, less intense luminaires are often less obtrusive to adjacent properties and allow the nighttime sky to be seen. They only illuminate the streetscape as intended. Sidewalks in suburban neighborhoods typically have a minimum width of 1.2 m (4 ft). While they may lie parallel to the street, they may also meander within the right–of–way or lie entirely outside of it. TND designers try to keep walking as convenient as possible, and this results in shorter distances when sidewalks remain parallel to the street. The focus is on a safe and pleasant walking experience. The typical minimum sidewalk width is 1.5 m (5 ft) because this distance allows two pedestrians to comfortably walk side–by–side. Walking distances should be kept as short as possible, and in traditional neighborhoods, horizontally meandering or vertically undulating designs are avoided even though these features may add interest. Neither should a pedestrian route be perceived as longer than the same driving route, nor should it create undue mobility problems for visually impaired pedestrians or people who use wheelchairs. Standard suburban developments feature front setbacks of 4.6 m (15 ft) or more for several reasons. Setbacks allow road widening without having to take a building and compensate its owner. They help sunlight reach buildings and air to circulate. In addition, side and rear setbacks afford access by public safety officials. Traditional designs have no minimum setback and, indeed, maximums may be specified by some policymakers. The goal is to integrate residential activity and street activity and, for example, to allow the opportunity for passers–by to greet neighbors on their front porches. Furthermore, the walls of nearby buildings help to vertically frame the street, an important aesthetic dimension. TND projects are intensely planned and closely regulated as to types and ranges of use and location. Such planning affords the otherwise unusual opportunity to have a good degree of understanding about the future traffic demands for a street and to design for those needs. Furthermore, to minimize the need for future widening, TND streets have adequate rights–of–way, typically not too dissimilar to standard requirements, and the buildings do not encroach on the right–of–way. Within the right–of–way, the typical TND street will have a planting strip of 1.8 m (6 ft) or so on each side, and parking lanes on both sides of the street (sometimes striped, sometimes not), both of which provide opportunities for some widening without a great deal of effort if in the future a wider street is needed. The importance of parking for suburban projects cannot be overemphasized because nearly all trips are by car. 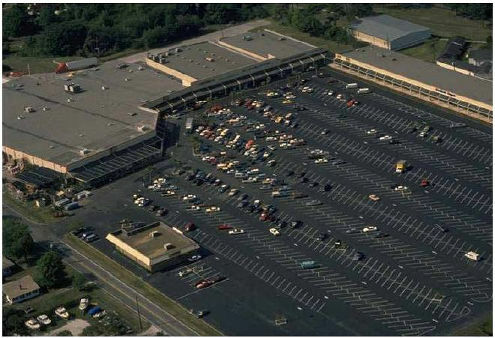 Off–street parking is preferred; indeed, large parking lots immediately adjacent to the street give a certain status to retail and commercial establishments (see figure 6–5). Sometimes, suburban parking is allowed on the street in front of smaller stores. Because of the importance of vehicle access in suburban development, city ordinances typically establish minimum parking criteria. Figure 6–5. Photo. Typically, suburban parking lots in retail developments are vast—and rarely full. Traditional design encourages on–street parking by counting the spaces toward maximum parking space requirements. The parking is usually no more than one layer deep. If the adjacent development contains residential and other uses, parallel parking is recommended. In commercial areas, 90–degree head–in and diagonal parking are permitted. Parking lots are usually built behind stores. As a result, the street front is not interrupted by a broad parking area. On–street parking is a concern for some traffic engineers. The concern is that dart–out crashes (where pedestrians, especially children, dart out from between parked vehicles into the traffic stream) will increase if on–street parking is encouraged. The proponents of TND projects argue that a row of parked vehicles enhances pedestrian activity by creating a buffer between pedestrians and moving traffic, that the overall street design slows moving traffic so that any crashes that do occur are less severe, and that the active streetscape makes drivers more alert to pedestrians. There is also some evidence that children in standard neighborhoods are susceptible to driveway backing crashes. On–street parking, therefore, must be limited to streets where the design fosters low speeds (32 km/h (20 mi/h) or less) for moving traffic. If a completed traditional neighborhood or transit–oriented development is located nearby, conduct a thorough critique of it. Does the development adhere to the guidelines in this chapter or to others published on this topic (see reference list below)? Does the development include a mix of land uses? What types of destinations can residents walk to? Describe the successful elements of the neighborhood, as well as the unsuccessful elements. Post, Nadine M., "Putting Brakes on Suburban Sprawl," Engineering News–Record, May 9, 1994, pp. 32–39. A Policy on Geometric Design of Highway and Streets, 5th ed., AASHTO, Washington, DC, 2004. Bressi, T., Ed., The Seaside Debates: A Critique of New Urbanism, Rizzoli Publications, New York, NY, June 2002. Congress for the New Urbanism, available online at http://www.cnu.org, accessed March 21, 2004. Gordon, P., and H.W. Richardson, "A Critique of New Urbanism," presented at the meeting of the American Collegiate Schools of Planning, Pasadena, CA, November 1998. "Neighborhood Street Design Guidelines: An ITE Proposed Recommended Practice," ITE Journal, ITE, 2004. Portland Pedestrian Design Guidelines, Office of Transportation Engineering and Development, Portland, OR, 1998. Traditional Neighborhood Development Street Design Guidelines: Recommended Practice, ITE, Washington, DC, 1999.